A hummingbird begins his life as an egg the size of a small pea, in a nest no larger than a cup. The little bird's life span can be remarkably short, at less than a year for many. If a hummingbird survives his first year, he can live to about age 5. A hummingbird spends most of his life in search of food, nourishing the highest metabolism in the animal kingdom. His wings beat 70 to 200 times per second, and he can fly up to 200 mph. 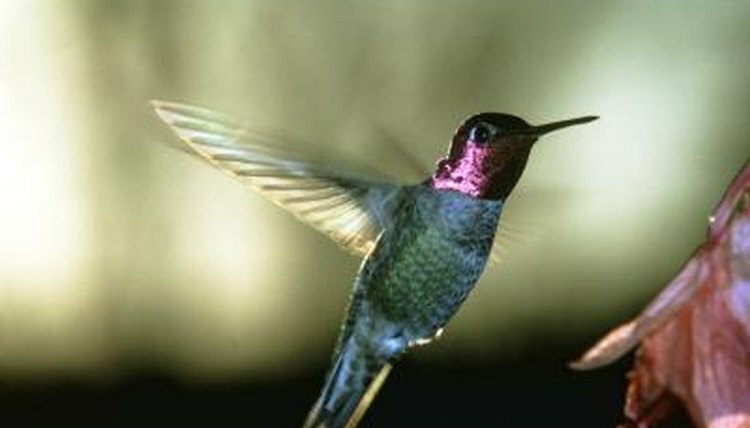 Hummingbirds can be found anywhere in North America, depending on the time of year. They summer as far north as Alaska and winter from Mexico to Chile. They return to cooler climates in the spring to build nests and raise their young. Male hummingbirds precede the females to their northern destinations, staking out territory for breeding grounds to prepare for the females' arrival. About a week after the males arrive, the females land to select their mates. Hummingbirds do not mate for life. A male may mate with several females during one season. Once breeding's done, the male moves on to breed again, leaving each inseminated female to build the nest and raise her young. The hummingbird nest is a work of art. A mother hummingbird will sometimes build several nests at once before laying eggs in her nest of choice only a few days after breeding. She chooses a location protected from the wind, usually in the fork of a tree branch shielded from weather and predators. The process takes about five days as the mother gathers spider webs and plant material, molding it carefully until it is perfectly formed. A mother hummer builds her nest alone, working about four hours a day, resting and eating during the remainder to prepare for laying her eggs. Once she is satisfied with her nest, the mother bird settles in to roost. As labor begins, she wiggles and shakes a bit to lay the first egg. She will lay a second egg a day or two later, but both eggs will hatch at the same time. The mother bird controls this by delaying incubation of the first egg until the second is laid. Once both eggs have arrived, the baby birds continue to develop in embryo form inside the eggs for 16 to 18 days, depending on the temperature. A mother hummingbird keeps the egg temperature at 96 degrees while they are incubating. She leaves the nest for five minutes each hour for food, ensuring that the eggs never chill. Inside the egg, baby hummers have strong necks and little hooks on their beaks to help them peck their ways out of the eggs. The baby birds' eyes are closed and their bodies have no feathers. The little hatchlings are about 1 inch long. The mother bird cleans the egg shells from the nest and continues to keep the babies warm until feathers begin to grow on their dark bodies. She makes brief trips for nectar and insects that she regurgitates into the babies' beaks. Although their eyes are not open yet, they feel the movement of air from her wings as she flies in and raise their heads to be fed. The egg teeth disappear shortly after hatching, but the babies' beaks remain short and yellow for several weeks. The tiny hummingbirds double in size by their third day of life and triple by the eighth. By the ninth day, the mother bird leaves the nest for longer periods to search for food. The little birds' bodies are large enough to fill the nest now. At day nine, they begin to hum their wings for the first time, clinging to the bottom of the nest to avoid falling out. They remain in the nest for another week, when their feathers and beaks have grown in. They will begin to venture from the nest around day 21, returning for the mother to feed them until about day 25. Fledgelings will not venture further out than a branch on their home tree initially. The mother bird teaches them where to find bugs and nectar, and ultimately chases them from the nest to live as adults. About this time, she begins construction on a second nest where she will lay another round of eggs and begin the cycle again.